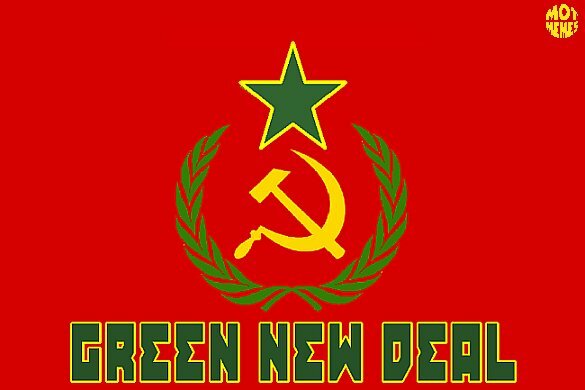 The AOC-presented “Green New Deal” scam has nothing whatsoever to do with “green energy”, job creation or cleaning up the environment. All of these political slogans are cynical attempts to deceive the gullible and naive. See how they misappropriate FDR’s “New Deal” in order to appeal to the older folks as well. This “Green New Deal” scam is really based on the ‘Hoax of the Millennium’ notoriously known as the CO2-driven Global Warming lie. Remember, the Democrats work full-time for the New World Order globalist cabal. The primary control mechanism manufactured by the NWO globalists was the fake Global Warming narrative based on human activity-generated CO2. They always conveniently forget to mention that geoengineering is the single greatest cause of Global Climate Change (GCC) And that’s why GCC manifests in such a regionalized manner. In other words, the most extreme geoengineered weather events are being fastidiously fabricated for great effect. Actually, it’s all being staged with Hollywood special effects to con the world community of nations into believing that humanity is facing a global ELE (i.e. Extinction Level Event). As people-powered nationalist governments are rapidly replacing globalist puppet governments around the world, the Global Warming hoax is being exposed like never before. By the way, that’s not to say that some of the new governments don’t have their own set of serious issues. This is also why a totally green and juvenile Bronx freshman — Alexandria Ocasio-Cortez — is being used as a pawn to roll-out this “Green New Deal”. They need to appeal to Generations X, Y and Z and every millennial that’s glued to their greenwashing smartphone. In this way, the globalists hope to so mind-control program these younger voters around the false notion that immediately going green will solve all the world’s problems. Yes, it a great way to go, but NOT if the globalists are in charge, that’s for sure. In truth, the primary goal of the Global Warming hoax was to justify the formation of a One World Government. This was always the capstone of the multi-century New World Order scheme to enslave humanity without them knowing that they’re slaves. Only with this surreptitious approach could the NWO perps manufacture consent from a critical mass of people worldwide to proceed with totally locking down the planet—1984-style. For it’s not just a One World Government that’s being slowly and stealthily shoehorned into place, it’s the theft of all natural resources that is being conducted in real-time. Exerting absolute control over the weather is also sought as a means of population control anywhere and everywhere on planet Earth. There are obviously many other reasons why the NWO globalists want to establish a One World Government. These are well beyond the scope of this exposé. See One World Government: what’s it all about? It’s of paramount importance to comprehend the NWO strategy of electing a 28-year-old bartender from the Bronx who is totally clueless about these weighty matters. 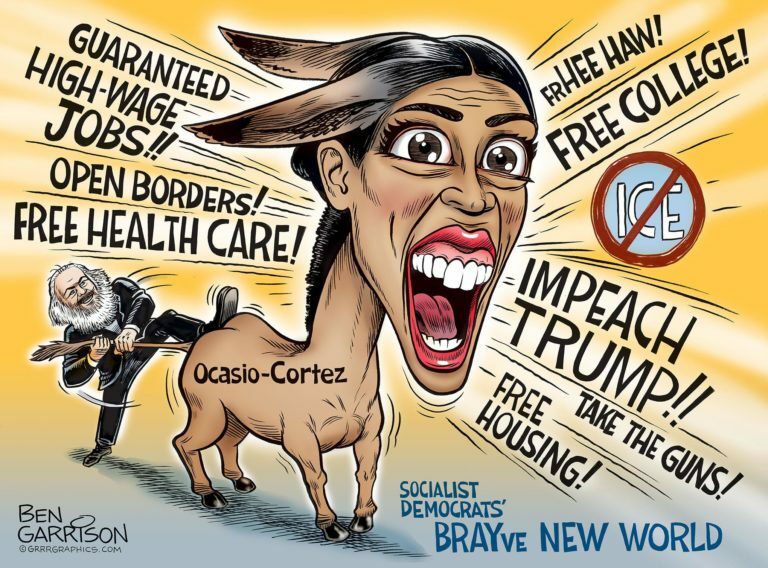 Watching her daily displays of utter stupidity, one wonders if the Democrat Party really chose her as the PERFECT donkey mascot. 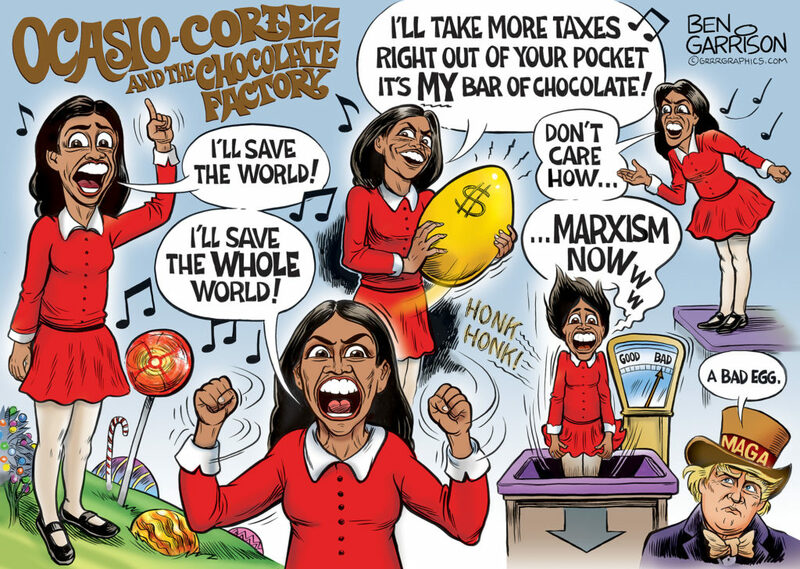 AOC herself is quite likely unaware of the intense mind-control programming she has been exposed to by via her various socialist, communist and bolshevik handlers. How else does she come out of nowhere and improbably win an election as she did… … …except by purposeful design? 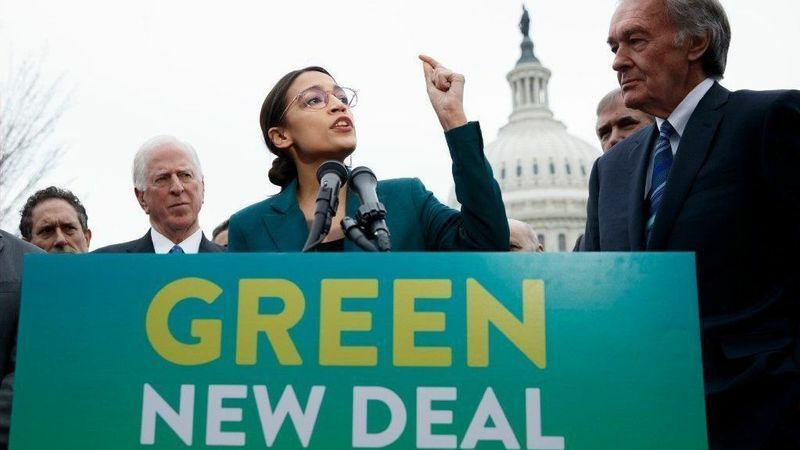 Soon after taking her seat in the House, she quickly floats a massive, complex and convoluted plan— the”Green New Deal” (GND). Where the heck did that come from so fast except from her communist masters? The globalists even coerced the Democrat U.S. Senator from Massachusetts — poor Ed Markey — to join her in order to bring some political heft to the staged AOC photo-ops. That’s an obviously embarrassed Ed on the right. This entire GND kabuki theater is designed to draw in as many citizens as possible. The perps need to GREENly arouse as many voters as possible if they are to successfully pull of this con of the decade. And AOC is their ace in the hole to fake out the American body politic—the Left side, that is. Not only did AOC come out of nowhere and assemble over 3 million Twitter followers in a day and a night, her Twitter feed is one of the most active in the country. Clearly, Big Social Media and Big Tech are pushing her NWO agenda like no other politico on the Internet today. She’s also receiving LOTs of attention by the Mainstream Media in spite of her wacky ideas and mortifyingly childish presentation. Truly, this young girl doesn’t even know what she’s talking about 99% of the time. All of which translates to a HUGE deception-in-progress. It’s also no coincidence that the GND roll-out occurred right in the middle of various states passing legislation permitting infanticide. The cultural marxists desperately needed all the diversion they could get to change the raging public discourse on that ongoing debacle. After all, it really represents A Highly Organized and Coordinated Attack on America. There’s a clandestine communist plot afoot to overthrow the Trump administration and subvert the American Republic. About this ever-intensifying reality, the Patriot Movement should have no doubt. In order to carry out this vast conspiracy to collapse the nation, the cultural marxists are hell-bent on sowing seeds of chaos whenever and wherever possible. For in the midst of so much anarchy and lawlessness, the globalists intend to take full advantage of this carefully engineered opportunity to execute a takeover of the U.S. Government. However, there’s also a much larger scheme unfolding right in the Congress. And, it is this treasonous conspiracy that threatens the American Republic as no other in U.S. history. First, let’s be clear: the primary energy paradigms that currently power societies around the globe are dirty and destructive, dangerous and detrimental. In point of fact, the fossil fuel, hydrocarbon fuel and nuclear power platforms are each extremely problematic for people and planet alike. With this understanding it’s always a good thing to transition the planetary civilization away from these and over to free energy sources of which there are several. However, this can only happen over a sufficient stretch of time and in a fashion so as not to totally destroy the global economy. This is how the globalists intends on using the Democrats to destroy the U.S. economy. The Left is always a willing dupe in these nation-busting enterprises.